WASHINGTON — In September, we said that Democrats had a clear path to picking up the net of two seats they need to retake the Senate — win in Arizona and Nevada, hold on to all of their seats, or lose just one seat but make up for it with win in Tennessee. 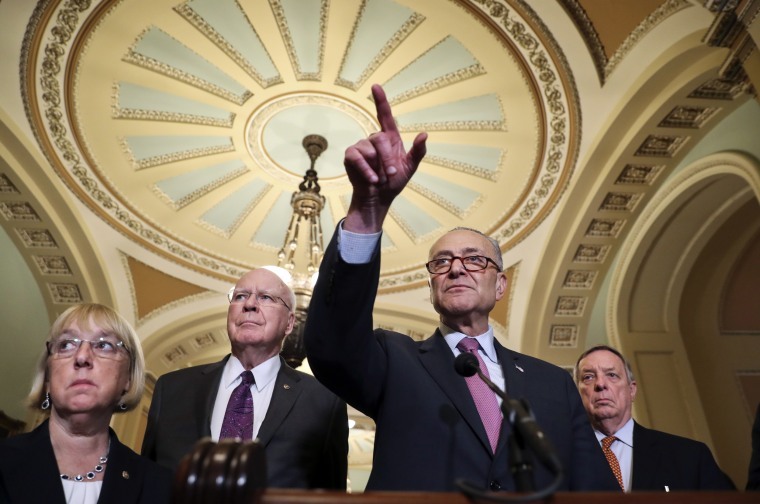 A month later, especially after the Kavanaugh nomination dominated the political headlines for three weeks, that path still exists for Democrats. But it’s looking much more difficult than it did in early September. Problem #1 for Democrats: Two recent public polls have showed Sen. Heidi Heitkamp, D-N.D., trailing by double digits. And a Democratic loss in North Dakota means that Democrats would have to run the table everywhere else to win the Senate majority. Problem #2: Two more recent polls have Democrat Phil Bredesen trailing in Tennessee. An important reminder, however: All of the U.S. Senate races are knife-fights, and it’s very possible that — once the Kavanaugh story fades away and others surface — the North Dakota and Tennessee contests could get closer. And as usually the case with midterm elections, the way the political winds are blowing will matter. And Nevada has the third-lowest share of women over 25 who have a bachelor’s degree or higher, also 23.2 percent. The others: Mississippi (22.6 percent), Arkansas (22.2 percent) and West Virginia (20.1 percent). The recent Democrat success in Nevada — Obama in 2008 and 2012, Harry Reid in 2010 and Hillary Clinton in 2016 — has been due largely to the growing Latino vote in Nevada. But the college-educated white women that are fueling much of the Democratic resistance across the country? There aren’t as many of them in Nevada as there are in, say, the Midwest. President Trump has had no trouble condemning foreign countries and leaders he disagrees with (Iran, Venezuela, North Korea — before the détente on nuclear weapons). Which is why his near-silence and cautious words regarding journalist Jamal Khashoggi’s death/disappearance are so striking. In truth, however, many of the Democrats who are running in the most competitive districts and states are NOT supporting Bernie Sanders’ single-payer plan. Instead, they are calling for a public option or Medicare buy-in for those 55 and older.